The Kulinarya Cooking Club's theme for this month is a healthy version of a dish for one's birthday party. I know we tend to indulge and throw our cares away on our birthdays but with the holidays just over, it makes sense to think of delicious yet healthy dishes that we can serve for celebrations. There are actually a lot of healthier options that won't change our celebrating mood at all. A lot of cooking methods such as roasting, grilling and steaming cuts down on fat yet puts in more taste. Instead of making a healthier version of a dish, I chose a dish that's naturally low in fat but has masses of flavour. 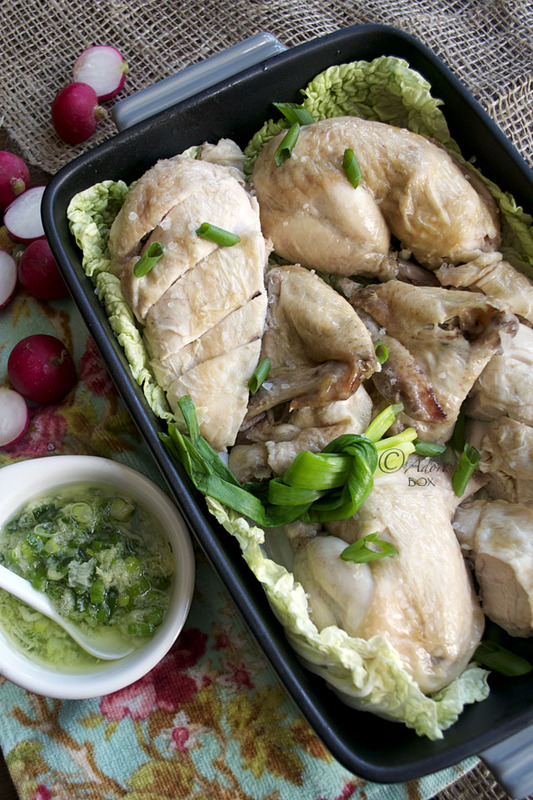 This dish is called pinaupong manok in Tagalog. It simply means chicken cooked in a sitting position. It is a whole chicken set to squat on a bed of salt (same position as a beer can chicken) then covered with more salt and cooked slowly until it cooks in the salt. I lay my chicken flat on its back so that I can use a smaller pot and less salt. The salt bakes the chicken in a steamy heat resulting to a very tender, succulent and extra tasty chicken. 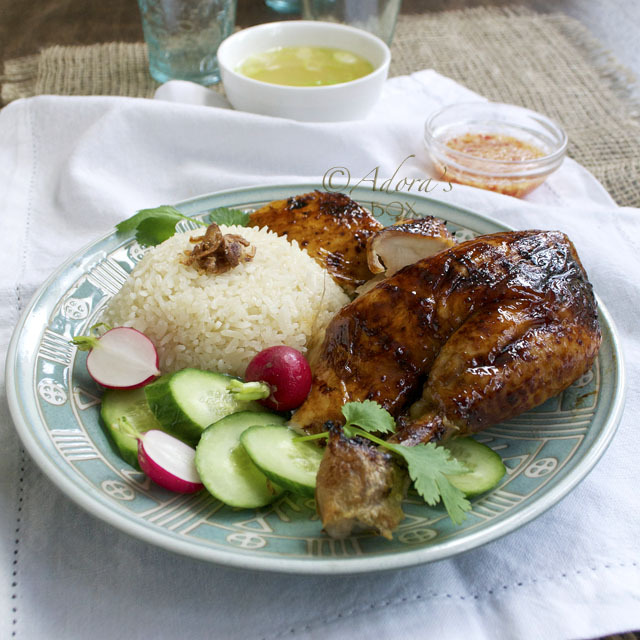 The salt does not make the chicken salty at all but gives it an extra savoury taste. Pre-heat the oven to 350° F/ 180° C.
Stuff the chicken with a few pieces of ginger, garlic and spring onions. Half fill a wok with water and add the soy sauce, salt and the rest of the garlic, ginger and spring onions. Bring to a boil and simmer for five minutes. Put the chicken in and parboil for 2 minutes on each side. Take out of the water and leave to rest on a rack to dry. This will only take a few minutes. Rub the skin with sesame oil. 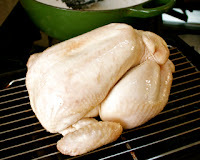 Lay the chicken on its back on a piece of muslin or cheese cloth. Wrap it up, with the seam on top for ease of unwrapping. 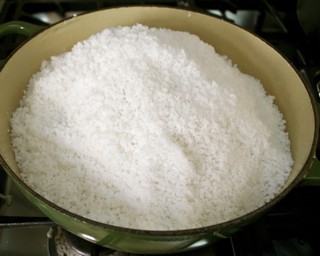 Heat up the salt in a heavy pot that's big enough to hold the chicken. When the salt is hot, take half off the pot. Lay the wrapped chicken, breast side up, on top of the salt. 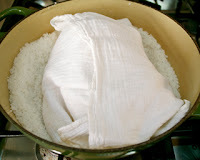 Cover with the rest of the salt, then with a sheet of foil. Cover with the pot lid. Bake for 1 hour, then take the pot out of the oven. Leave to rest for 20 minutes before opening the pot. 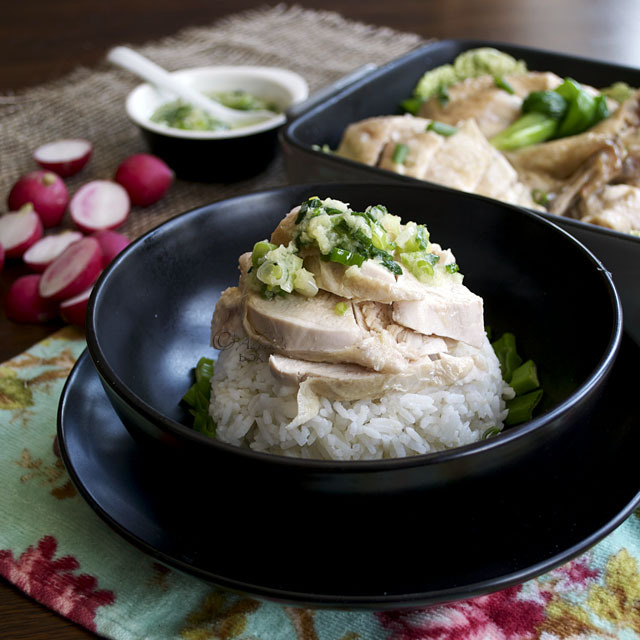 Take the chicken out of the salt, unwrap and chop into serving pieces and serve with the spring onion and ginger oil. Heat up the cooking oil in a small pan. When hot, add the rest of the ingredients, stir then take off the heat. Transfer to a small bowl and serve with the chicken. Thank you to our Kulinarya hosts for this month, Pearl of My Sassy Chef and Thea of Words and Nosh. Please visit the blogs of the other Kulinarya Cooking Club members to see what they have prepared for this month's theme. 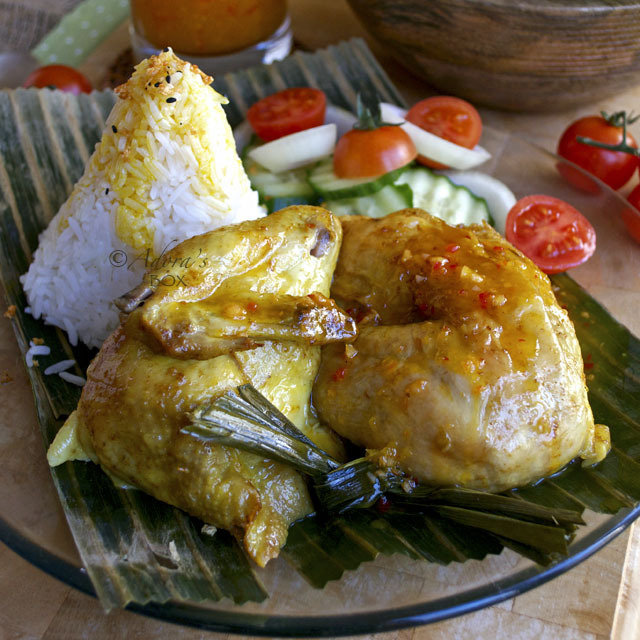 oh my, I was searching for this recipe as my partner loves Baked Salted Chicken! I have got to try this. Thank you lots and lots!! Salted-baked chix is one my fave dishes! This is so cool! Great post, I am definitely sharing your recipe with my foodie friends. Love your photos btw. It looks so moist, I am so sure it delicious! Thanks for sharing the this technique. 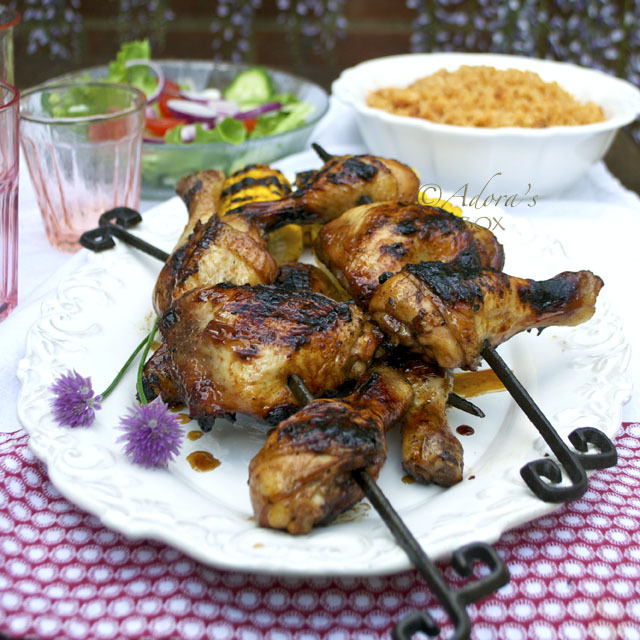 I love chicken and this looks amazing! Beautiful! I really think you have the best chicken recipes among food blogs! This is one my favorite chicken dishes when we visit my parents...yum yum! Yummy, I love the ginger and spring onion oil! I've been steaming chicken too recently but I have not done pinausukan manok yet. thanks for sharing the recipe. will definitely give it a try. I love, love this chicken! This is my favorite way to cook/eat chicken! So healthy! Must try this soon. Thanks for the recipe! That looks stunning! SO moist and delicious! Beautiful chicken! I love your photos! 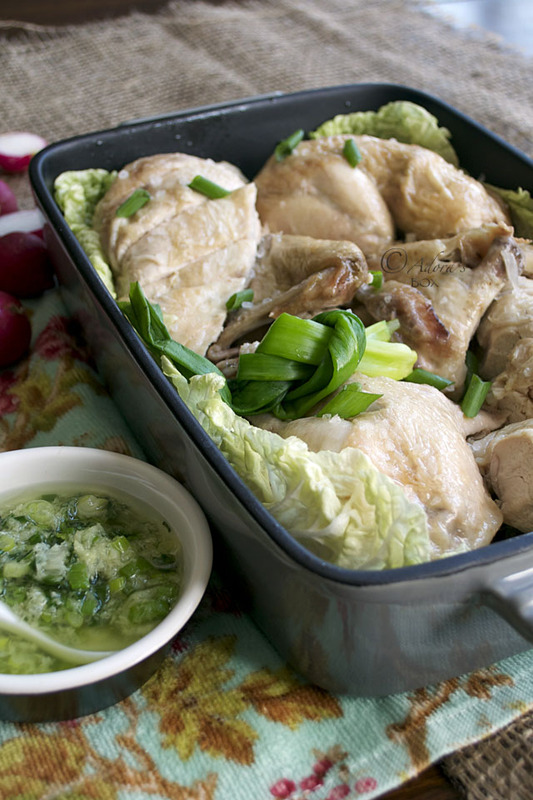 I love this chicken and it must taste delicious especially with the scallion and ginger oil drizzled all over it. This is a good Kulinarya post, Adora. Your pinaupong manok looks so delish. Never tried having it baked before, I usually just put it in a kaserola then just cook it on the stove. Im bookmarking this, will do it baked next time! Thanks for this recipe. I haven't tried making pinaupong manok myself. I want to try this light version of yours. It sounds fantastic especially with your onion and ginger oil! 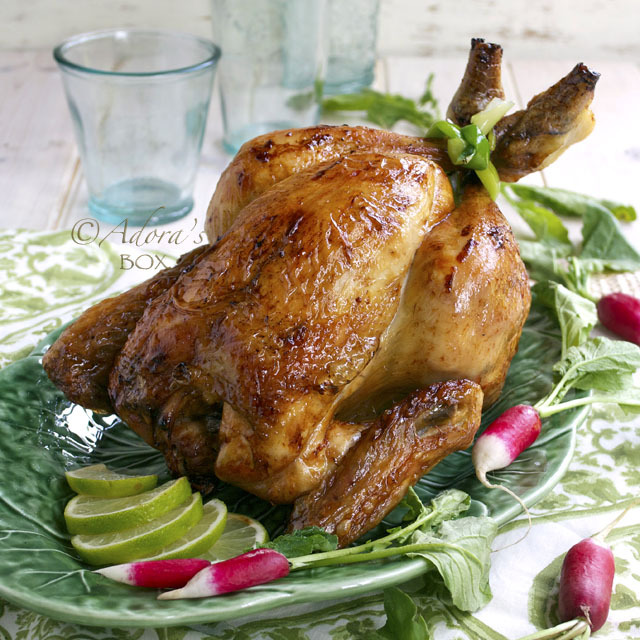 I love a good whole chicken recipe, and will definitely try this one out! Looks fantastic! Now i know what to cook this weekend =) thanks for sharing your recipe ! Your photos are amazingly appetizing ! Any suggestions where to find rock salt? After a year of inquiring at different grocery stores and department stores in Baltimore and not finding it, I finally ordered it online to pick up at Ace Hardware - Ice Cream Salt - but it was about US$5.00 for only 4 lbs. That expense really increases the cost of this recipe. Where are readers finding their rock salt (or are you using coarse Kosher salt or something else)? Any coarse salt will do.